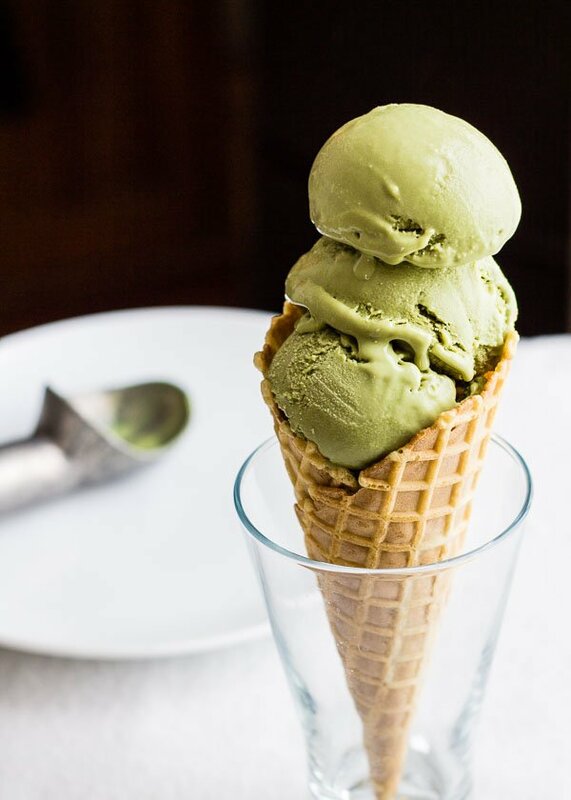 Refreshingly bittersweet ice cream. 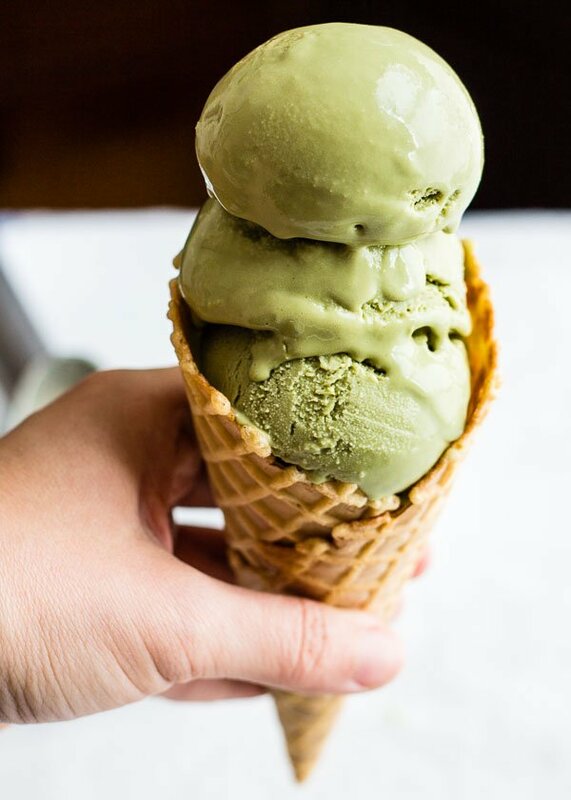 Pure matcha, cool and melty. My instagram blew up while I was asleep. I guess people are ready for ice cream. Sweet, cause I need more opportunities to practice my scoops. Here we have a triple decker, though I will admit, that 3rd scoop perched on top was not necessary. My belly was very full after. The ice cream melted all over my hand and even dripped on my tripod. I shut the camera off and stuck the entire cone in my mouth. It was glorious. 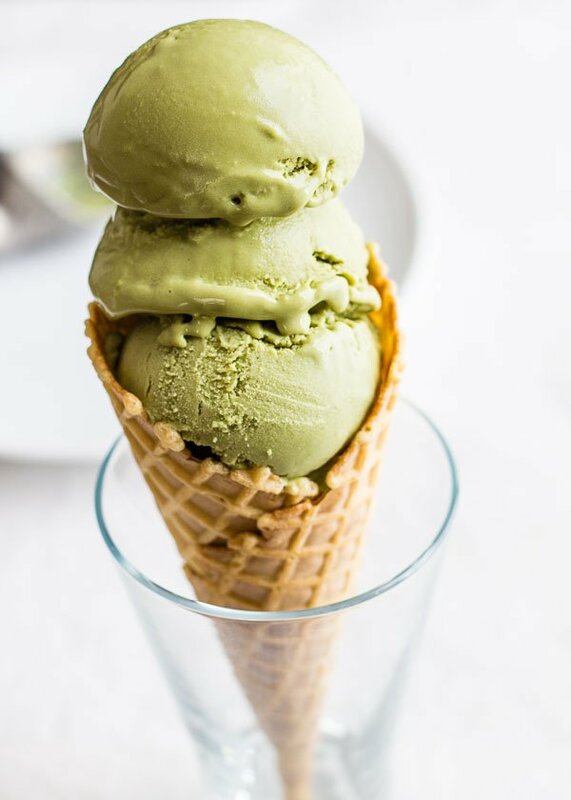 Many ice cream recipes call for 5 egg yolks, which makes a rich custard base, but in order to stay true to the lightness and purity of matcha, I reduced the egg yolks to 3 and added a couple tablespoons of flavorless cornstarch to help thicken the ice cream base a bit more. 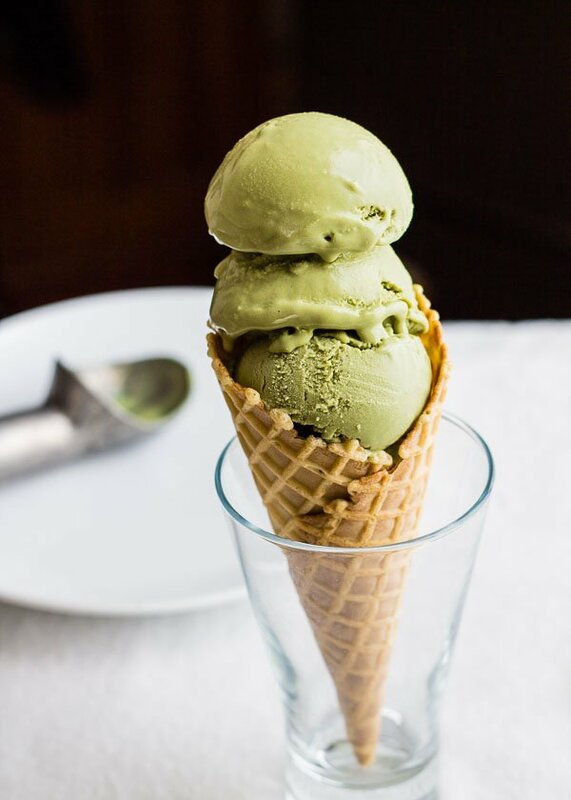 Other green tea ice cream recipes don't call for any egg yolks at all, but some yolks are necessary as an emulsifier. Otherwise the fat in the cream and milk will separate from the water during the freezing process and result in a grainy texture. 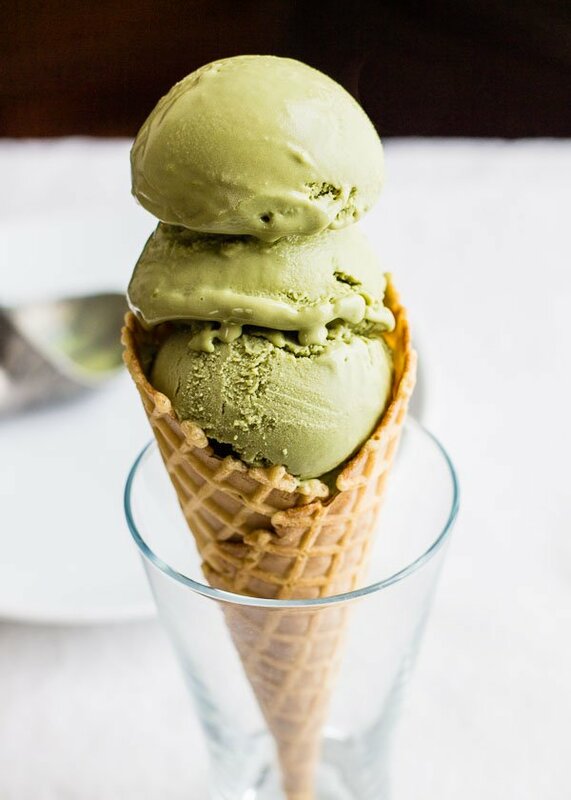 This ice cream feels smooth and tastes singularly of green tea. Lightly whisk egg yolks in a medium pot, then whisk in a little cream. Add the rest of the cream, milk, and sugar. Set the pot over medium-high heat and sift in the cornstarch while continuing to whisk. Keep whisking slowly until the mixture begins to boil. As soon as you start seeing steam or bubbles rising, start whisking very fast as the mixture thickens. This will happen quickly. As soon as the mixture thickens, turn off the heat and move the pot to a cool burner. Sift the matcha into the mixture while continuing to whisk. Pour the mixture through the fine mesh strainer into a medium mixing bowl. Fill a larger mixing bowl with a little cold water and ice, then set the medium mixing bowl over the ice bath. Don't let the water come up too high on the sides. Keep whisking until the mixture is cool (you might need to change the ice bath a couple times), then chill in the fridge until completely cold. If you're planning on eating this as soft serve, churn in your ice cream maker now. If you're planning on freezing it, whisk the vodka into the ice cream base, then churn it. This will keep it a little softer in the freezer. Once frozen, defrost at room temperature for roughly 15 minutes before scooping. 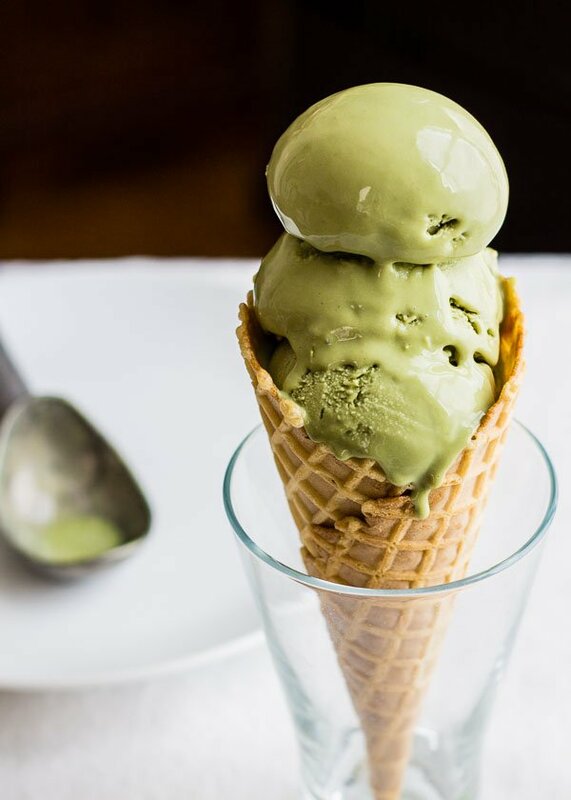 Matcha seems to be the latest trend these days, though they’ve been sticking around for quite a while. Thanks for the recipe ! We love what you’re cooking up here. Are you interested in becoming a Chicory App Recipe Partner? well done.. 🙂 nicely worked on it…. Looks amazing! Regarding your egg yolks note…have you tried Jeni’s (Splendid Ice Cream) base? No eggs and uses corn starch, cream cheese and corn syrup. I usually use arrowroot and skip the corn syrup and actually prefer this to egg-based ice cream, both for texture and flavour!